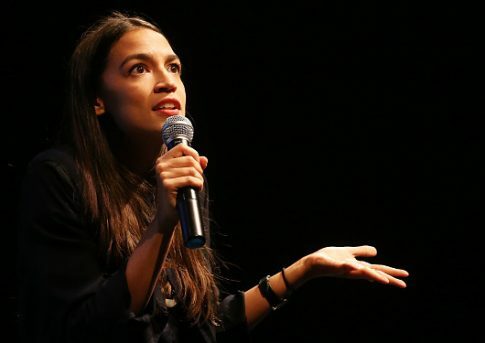 Alexandria Ocasio-Cortez tweeted Wednesday the "Right is being particularly feisty towards me" as a means of distracting from the indictment of Republican Rep. Chris Collins (N.Y.). "Whenever the Right is being particularly feisty towards me, the first thing I do is check to see which bad news of theirs they’re trying to distract from. Lo and behold," she tweeted, linking to a story about Collins, who is a strong Trump White House supporter. However, Collins' indictment didn't break until after 9 a.m. on Wednesday morning, while the losses by Ocasio-Cortez's preferred candidates happened Tuesday night. Ocasio-Cortez has deflected criticism of her in such a fashion before. When she made widely panned remarks last month that the unemployment rate was low because "everyone has two jobs," she called a clip of her remarks "selectively spliced" and "hysteria of the alt-right." Hey Stephanie, it’s important that we not give into the hysteria of the alt-right. This is selectively spliced clip from an outlet that has published pieces by white supremacists. I encourage you to watch the true, full, undoctored episode.